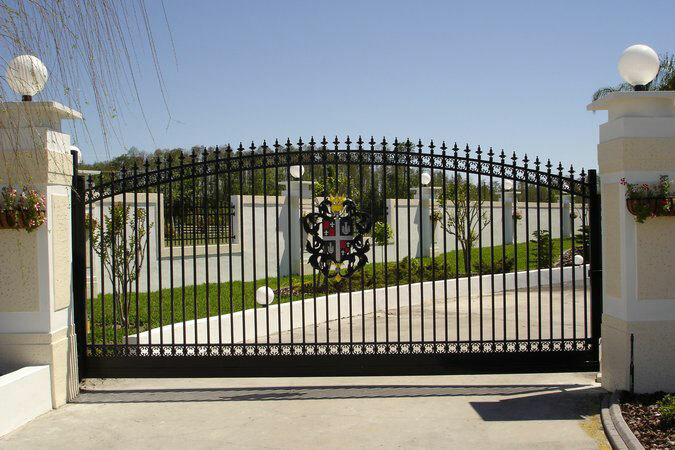 Rose Fence specializes in the manufacturing and installation of aluminum driveway gates for your property. Our driveway gates come in both swinging and cantilever slide gates and installation of automated gate systems with phone and keypad entry systems for residential, commercial and industrial applications. Rose Fence builds each gate in-house specific to its application. Each gate is built from durable raw aluminum materials and is highly customizable. All aluminum products have a powder-coated finish and come with a limited lifetime warranty on the finish. We have the ability to provide custom water-jet logos, symbols, and custom designs thanks to our in-house drafting and design department. There are many styles, colors and accessories available.